It's possible to add registration, provider or reference numbers to individual staff members, which are then displayed on invoices. In a health/wellbeing industry and are required to include your registration/provider number on your invoice. Are a self-employed contractor and need to include your own business registration details. Work with insurance providers and are required to display a provider number on invoices. Add a reference number to a staff member's profile. Select a reference number on the invoice. Head to Setup > Staff and click Edit next to the staff member. Note: It's possible to add multiple numbers/number types for each staff member. However, only one number/type can be displayed on an invoice at a time. You can add two numbers by adding one in the Reference number type field and the other in the Reference number field. Once you've added some reference numbers you can choose which number to add to the invoice. 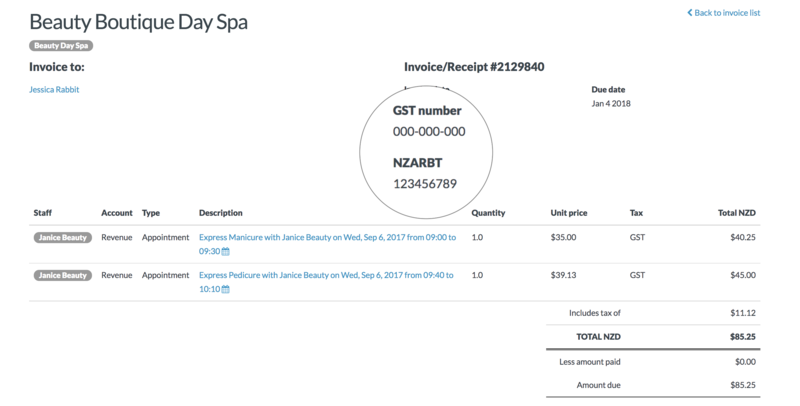 Raise/edit the invoice as you would normally. Click Save to raise the invoice.